SUMMARY. Several studies focused on mothers’ psychopathological and environmental risk factors linked to filicide, to understand the genesis of this violent act. Considering the transition to motherhood a critical period for any woman, requiring the activation of deep personality resources, the aim of this study was to detect, in a sample of 16 filicide women hospitalized in Italian Forensic Psychiatric Hospitals, the recurrent characteristics with a specific focus on personality traits. Women were assessed using Structured Clinical Interview for DSM-IV Axis I Disorders (SCID-I), Big Five Inventory (BFI) and Temperament and Character Inventory (TCI). The BFI and TCI profiles seem to overlap showing a personality profile characterized by a rigid control of aggressive impulses, the avoiding of unconscious fears and the masking of feelings of negativity. Examining the mother’s mental state with respect to personality traits, could help clinicians to detect specific temperament patterns that may carry out impulsive violent behaviors, if correlated with other psychopathological and environmental factors. KEY WORDS: Childbirth, infanticide, postpartum depression, personality. RIASSUNTO. Diversi studi si sono concentrati sui fattori di rischio psicopatologico e ambientale legati all’uccisione del proprio figlio, al fine di comprendere la genesi di questo atto così violento. Considerando che la transizione al ruolo di madre rappresenta un periodo critico per ogni donna, che richiede l’attivazione di profonde risorse di personalità, lo scopo di questo studio è stato di rilevare gli elementi clinici ricorrenti, in un campione di 16 donne figlicide ricoverate in un ospedale psichiatrico giudiziario italiano, con un focus specifico sui tratti di personalità. Le donne sono state valutate con l’intervista Structured Clinical Interview for DSM-IV Axis I Disorders (SCID-I), il Big Five Inventory (BFI) e il Temperament and Character Inventory (TCI). I profili BFI e TCI sembrano sovrapporsi mostrando un profilo di personalità caratterizzato da un rigido controllo degli impulsi aggressivi, con l’evitamento di paure inconsce e il mascheramento di qualunque sentimento di negatività. Esaminare lo stato mentale delle madri a rischio, e nello specifico i loro tratti di personalità, potrebbe aiutare i clinici a individuare specifici modelli di temperamento che possono condurre a comportamenti violenti impulsivi quando correlati ad altri fattori psicopatologici e ambientali. Parole chiave: Parto, infanticidio, depressione post partum, personalità. Epidemiological data on deaths in infancy and childhood estimate that parents are responsible for more than half of the murders1. Among the other cause of dead, filicide rate ranges from 2% to 10%2, even though a correct estimation of such episodes is difficult to achieve because they are often underestimated and miscategorised by other causes of death3. Literature classify three type of child murdered: neonaticide refers to the murder of children by their parents within the first 24 hours of life; infanticide is used for the murder of a child that takes place within the first year of life; filicide broadly indicates the murder of offspring by parents, after the first year of life of the child4. In neonaticide, mothers’ profile is characterized by a young age (<25 years old) without a history of any psychiatric diagnosis. Some clinical reports of neonaticide describe a presentation of pregnancy denial associated whit dissociative symptoms5-7. Socioeconomic difficulties are often reported along with the absence of a solid couple relationship or marriage as well as conflicts with partners or other family members. The pregnancy is often unwanted and when these women get with a newborn infant whose existence they find undesirable, they kill the infant, thereby eliminating the problem2,8-10. While neonaticide is enacted on impulse, infanticide and filicide are mostly premeditated8. Whereas during the first year after birth murders are mostly committed by the mothers, during later infancy it is the fathers who are more frequently involved in filicide11. A recent study found that the mean age of child victims of mothers found not guilty by reason of insanity in two states was older than 3 years12. In infanticide and filicide, mothers are older (>25 years old) than those who commit neonaticide. Several studies have focused on the psychopathological and social environmental risk factors of the filicide mothers linked to their offspring’s murders. In particular, a psychiatric history the attachment style and socioeconomic factors (i.e. economic difficulties, couple conflicts, lack of prenatal care) resulted as having cumulative interactions in offsprings’ homicides. A high level of stress with a lack of any psychological or emotional support was reported at the moment of the murder. Indeed, severe couple conflicts were described in long-term relationships/marriages as well as disagreements with the family of origin 4,11,13-19. Recent studies highlighted that the mother’s internal working models of attachment (mainly insecure and disorganized patterns of attachment) are relevant variables to predict not only the caregiver’s sensitivity and emotional availability, but also the new mothers’ behavioral adjustment (including violent behaviors), levels of perceived distress and even phase-related psychopathological outcomes20-25. 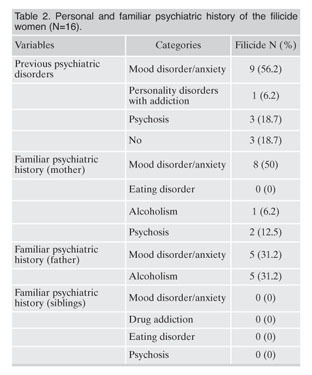 The incidence of psychiatric diagnoses has been extensively investigated in the literature, representing an important risk factor for filicide in comparison with other variables, such as socioeconomic and environmental variables15,16. The most relevant mental conditions connected with infant murders are psychosis and anxiety/mood disorders4. Up to 20% of women present some kind of mood disorders after the birth of a child26. Although some new mothers with depression report intrusive and obsessive thoughts about being able to harm their child, this personal emotional condition usually is confined at the only fear of hurting the newborn27. Instead, severe psychotic depression can be at higher risk of suicide and infanticide28. In a study by Lewis and Bunce17 of 55 filicidal women, 52.7% were psychotic. However, it should be considered that puerperal psychosis only affects 1-2% of the female population and just 4% of these women, if untreated, probably commit infanticide29. Several studies also underlined a significant percentage of personality disorder diagnoses among these mothers30. Lewis and Bunce17 reported a prevalence of diagnoses of personality disorders (67%) respect to other psychiatric syndromes. Personality disorders may represent a diathesis of vulnerability during the postnatal period or during the offspring’s growth leading to the development of depressive episodes31,32, often detected at the moment of infant murders. Specifically, an increased risk of affective disorders during the first year after birth seems to be related to specific personality traits, especially for neuroticism and introversion33,34. In the neurotic personality the management of stressful events and adaptive mechanisms seems to be compromised because of an emotional instability and a generalized tendency to experience negative emotions. However, the presence of a psychiatric diagnosis in the peri-partum period and a neurotic and introverted personality trait and the consequent affective failure, do not seem to be enough to justify the violent act accomplished. Considering that the transition to motherhood represents a critical stage for any woman34-36, requiring a strong activation of deep personality resources, the main aim of this study was to analyse, in a sample of infanticide/filicide women hospitalized in Italian Forensic Psychiatric Hospitals, the specific personality traits to detect a possible personality profile. Secondly, we also observed the socio-demographic characteristics, the psychiatric history and the different life stress events of this sample, in order to confirm previous data from the literature. To date, no study handled with defining the psychological profile of filicide women, assessed after the Court’s judgment. Understanding the psychological traits of these women, out of a legal context, means entering into their personality being able to gather useful information for the assessment of the potential risk of filicide acts. This study examined 16 mothers hospitalized in Forensic Psychiatric Hospitals in Italy, for having killed their own biological children, using data supplied by clinical documentation and by direct interview. The assessment was made after receiving the sentence, from 1 to 4 years after the murder. We collected the sample from 2014 to 2017. Exclusion a-priori criteria were: diagnosis of mental retardation, poor knowledge of Italian or other verbal communication limitations that compromised the ability of the subject to follow the research protocol. Before being enrolled in the study, participants were informed of the nature and objectives of the research, and give the consent to research. The study was approved by the local ethics committee. This group was compared with results of a group of 106 psychotic and depressed mothers, outpatient of our psychiatric ambulatory, selected in order to have similar age and instruction level of filicide ones. – in order to evaluate the behaviour style of these filicide/infanticide women we assessed the Italian version of the Temperament and Character Inventory (TCI)41: a 240-item inventory that operates with seven dimensions of personality traits: four temperaments (Novelty Seeking, Harm Avoidance, Reward Dependence and Persistence) and three characters (Self-Directedness, Cooperativeness and Self-Transcendence). For each of the 235 items, respondents indicated the extent to which they usually act or feel on a 5-point scale ranging from ‘very false for me’ (1) to ‘very true for me’ (5). Descriptive statistics are reported for sociodemographic variables, psychiatric diagnosis and psychiatry family history, life stressors, traumatic events and personality profiles. Student T test was used to compare filicide group with outpatient sample. Filicide had from 32 to 45 years (M=38.13, SD=3.93). The majority were married or with a stable partner when the crime occurred (93.7%). Education years were 13.31 (SD=3.85): 31.2% had a primary school diploma, 43.7% had a high school diploma, while four had a university degree. 62.5% of the participants were employed at the time of the murder. 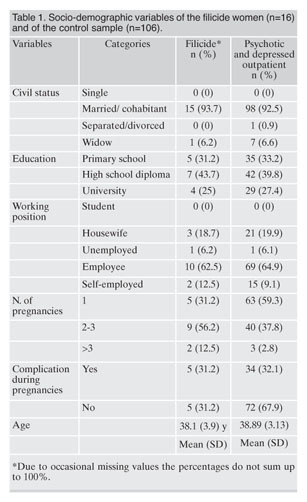 Most women had 2 or 3 children at the time of the murder (56.2%), and 31.2% reported complications during pregnancy (Table 1). Comparison group of outpatient had similar demographic characteristics without significant differences in age (M=38.89; SD=3.13), marital status and instruction (M=12.94; SD=3.70). With regard to traumatic or stressful events that had occurred in their lifetime, 43.7% (N=7) of the filicide reported having suffered mourning, 50% (N=8) reported conflicts with the family of origin, 37.5% (N=6) reported marital conflicts, while illness of a relative was reported by 37.5% (N=6) of the sample. Offence analysis is summarized in Table 4. Among the 16 women hospitalized in Forensic Psychiatric Hospitals in Italy, who had killed their own biological children, 5/16 women committed infanticide (age of the children ranged from 35 to 240 days), 7/16 committed filicide (age from 13 months to 16 years) and 3/16 committed both infanticide (age from 21 to 90 days) and filicide (age from 3 to 10 years) at the same time. In most cases the child killed was male. Stabbing was the most common method of filicide (31.2%). Choking as a method of death occurred in four cases (25%), drowning in four cases too (25%), poisoning and burning in one case each (6.2%). Seven (43.7%) of the 16 women in the current sample attempted suicide following the death of their child, one killed her own partner. Additionally, no family members or close friends in any cases reported concerns related to the mothers’ risk to kill. At the time of clinical evaluation, we found a good compensation of psychopathological symptoms in 13 out of 16 women. Three patients, with a psychotic spectrum disorder, were still in an acute phase. At the time of the evaluation, all patients were taking medication: eight (50%) were taking a combination of antidepressants and antipsychotics, three (18.2%) mood stabilizers and antipsychotics, two (12.5%) antidepressants and mood stabilizers, one (6.2%) just antidepressants and two (12.5%) just antipsychotics. 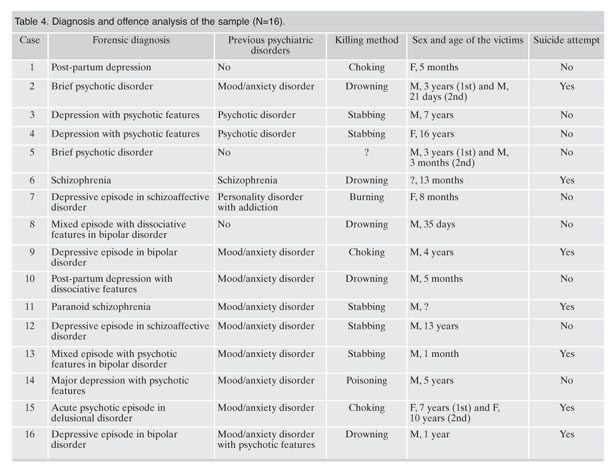 The diagnoses reported in forensic psychiatric examinations carried out after the murders are summarized in Table 3 and 4. Five women (31.5%) received a diagnosis of Mood Disorder without psychotic features: two women received a diagnosis of Post-Partum Depression (one with dissociative symptoms), two a diagnosis of depressive episode in Bipolar disorder and one a diagnosis of mixed episode with dissociative symptoms in Bipolar Disorder. Eleven women (68.7%) received a diagnosis of a psychiatric disorder with psychotic features: three were diagnosed with Major Depressive Disorder, one with mixed episode in Bipolar Disorder, two with Brief Psychotic Disorder, one with acute psychotic episode in Delusional Disorder, twi with Schizophrenia and two with depressive episode in Schizoaffective Disorder. The SCID-I interview showed the following psychiatric diagnosis in the past of the 16 women (only the Axis I diagnosis that represented the main clinical problem of participants were considered): nine subjects (56.2%) suffered mood or anxiety disorders, one (6.2%) personality disorder in association with drug addiction; and three women (18.7%) had received a diagnosis of a psychotic disorder. Table 4 shows the 16 subjects’ forensic diagnosis and psychiatric history. Nine women (56.2%) reported having had at least one interaction with a mental health specialist in the past and five (31.2%) women reported a previous hospitalization in a psychiatric hospital. Fourteen women (87.5%) had a family history of psychiatric illness: the disorders most frequently reported were a mood disorder among the patients’ mothers (50%%) and alcoholism among the patients’ fathers (31.2%). As can be seen from Figure 1, our sample shows a general propensity to have low scores on the Neuroticism dimension scale (M=23.8±5.9) and high scores on the Extraversion (M=28.1±6), Agreeableness (M=37.8±5.3) (the highest score in 7/14 subjects) Conscientiousness (M=36.9±5.1) (the highest score in 5/14 subjects) and Openness (M=34.3±7) scales (Figure 1). 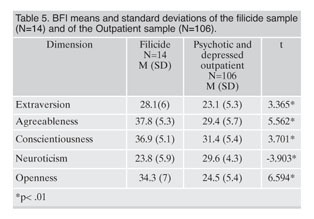 The comparison with the psychiatric outpatient sample (Table 5) shows that the Agreeableness, Openness, Extraversion and Conscientiousness mean scores were substantially higher in the filicide sample, while the neuroticism was lower in the filicide (p<.01). TCI mean scores were the following: Novelty Seeking M=92.1±21.1, Harm Avoidance M=94.9±16.9, Reward Dependence M=107±17.4, Persistence M=129.8±15.6, Self-directedness M=146.8±22.9, Cooperativeness M=143.2±19.2 and Self-trascendence M=71.1±22.1. The comparison with the psychiatric outpatient sample (Table 6) shows that Novelty Seeking, Persistence, Self-directedness and Cooperativeness were substantially higher in the filicide sample, while Harm Avoidance was lower (p<.01). Reward Dependence and Self-Trascendence were lower but without statistical significance. 4) high Openness scores in our sample may indicate the attempt to show a healthy and functional socially acceptable self-image. 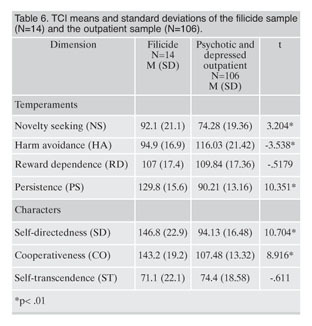 When the TCI test results were compared with those of a sample of outpatient psychiatric population with similar psychiatric disorders, filicide women showed higher scores at the Novelty Seeking, Persistence, Self-directedness and Cooperativeness dimensions, and lower scores at the Harm Avoidance scale, endorsing also in this test a profile that could be defined totally positive. In detail the TCI’ results could be interpreted as following: 1) high scores in the Cooperativeness, show a tendency to wear a social image of niceness and empathy; 2) high scores in Self-directedness is associated with a high internal self-control, confirming a profile of hyper and rigid self-regulation; 3) high scores in Persistence describe strong, active and stable people; 4) high levels of Novelty Seeking may be associated with more unexpressed anger and hostility; 5) low Harm Avoidance, shows the tendency to delete negative feelings, over-controlling disturbing emotions 41,45. Previous research found that high levels of Harm Avoidance and low levels of Self-directedness – which means at the opposite of our filicide sample – correlates with symptoms of depression and anxiety, and represent non-specific indicators of psychopathology46,47. It would be also useful to note that women with perinatal depression showed lower Cooperativeness scores than healthy postpartum women48 while higher Neuroticism significantly increase the risk of perinatal depressive symptoms in postpartum women49,50, and high degree of Agreeableness and Conscientiousness are related to a lower risk of perinatal depression34. Therefore, the result of the test highlight that the filicide women (11/16 with a diagnosis of psychotic episode, 9/16 with a diagnosis of depressive episode), present themselves showing profiles of healthy people, which have personality traits that are not correlated to any indicator of psychopathology differing both from the outpatients’ depressive, the psychotic population and the population of women with perinatal depression. Interestingly, our filicide mothers TCI scores, resulted in a medium range level when compared to the range scores of a healthy group of people, without any diagnosis of mental disorders and without prior criminal records 41. Another aim of the study was to investigate the presence of common socio-demographic features and clinical risk factors among the sample, not easy to distinguish because of the great variability among the reported diagnoses. Moreover 3 out 16 of the women resulted in an acute psychotic phase, making it difficult to collect some information. 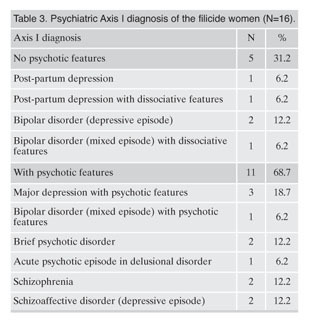 Descriptive results from this study seem to tally with data from the literature evidencing that major psychiatric disorders with psychotic features are among the psychiatric conditions most likely to be present in infanticide/filicide women. Our sample was made also of five women with a major affective disorder without psychotic features, two of them with dissociative symptoms. As confirmed by previous researches5-7, women from our sample with a dissociative episode killed younger infants (5 and 8 months). Among the several variables, a common aspect was represented by the familiarity of depression and alcoholism. With regard to traumatic or stressful life events, as expected, half of the women reported mourning and familial or marital conflicts, one third abuse from family members and all reported a personal history of neglect. In summary, the personality traits that we detected in our filicide group of mothers define the tendency to over-control negative feelings and to inhibit unpleasant and disturbing impulses, appearing kind, virtuous and trustworthy. We comment our results believing that the unconscious defence mechanisms of denial and repression of this group of women could be brought down because of stressors and life events, as could happen during the transitional phases of the pregnancy, leading to the loss of the rigid control on aggressive impulses and to the acting out of aggressive behaviours. Far from considering such emotional deadlock as a final explanation for filicide, we suggest that examining the mental state and personality traits of mothers with a psychiatric diagnosis and a history of numerous stressful events, in the post-partum period and in the aftermath, could provide the clinicians with very relevant information. Indeed, facing severe psychopathology or other sources of personal distress, may carry out impulsive violent behaviors in some specific personality profile. In particular, we propose that a timely diagnosis in addition to the exploration of the personality of the mother with a quick screening test like the Big Five Inventory, may help clinicians to detect important ‘wake-up calls’ for the risk of violent behaviors and giving to these at-risk women a closer psycho-social support in order to try to prevent such terrible consequences. Finally, the indications coming from our results are to be interpreted cautiously owing to some limitations of the study such as the small sample size that prevent the reaching of generalized conclusions and the absence of a more specific comparison group. In particular, as suggested also by Susan Friedman4, we think that future researches should focus on comparing mentally ill filicidal mothers with mentally ill mothers of similar socioeconomic status who did not kill their children. This in order to confirm that infanticide/filicide women have an extremely specific and peculiar personality profile which should be studied and considered as a possible risk factor of this inconceivable act. Acknowledgments: we would like to thank Dr. Antonino Calogero, past Director of the Forensic Psychiatric Hospital of Castiglione delle Stiviere, for his valuable help. 1. Wolkind S, Taylor EM, Waite AJ, Dalton M, Emery JL. Recurrence of unexpected infant death. Acta Paediatr 1993; 82: 873-6. 2. Craig M. Perinatal risk factors for neonaticide and infant homicide: can we identify those at risk? J R Soc Med 2004; 97: 57-61. 3. UNICEF. Annual report 2003. Available on: https://uni.cf/2MPUePz (last accessed on February 2019). 4. Friedman SH, Horwitz SM, Resnick PJ. Child murder by mothers: a critical analysis of the current state of knowledge and a research agenda. Am J Psychiatry 2005; 162: 1578-87. 5. Spinelli MG. A systematic investigation of 16 cases of neonaticide. Am J Psychiatry 2001; 158: 811-3. 6. Şar V, Aydın N, van der Hart O, Steven Frankel A, Şar M, Omay O. Acute dissociative reaction to spontaneous delivery in a case of total denial of pregnancy: diagnostic and forensic aspects. J Trauma Dissociation 2017; 18: 710-9. 7. Huchzermeier C, Heinzen H. A young woman who killed 5 of her own babies: a case of multiple neonaticide. J Forensic Leg Med 2015; 35: 15-8. 8. Porter T, Gavin H. Infanticide and neonaticide: a review of 40 years of research literature on incidence and causes. Trauma Violence Abuse 2010; 11: 99-112. 9. Putkonen H, Collander J, Honkasalo M-L, Lönnqvist J. Finnish female homicide offenders 1982-92. J Forensic Psychiatry 1998; 9: 672-84. 10. Resnick PJ. Murder of the newborn: a psychiatric review of neonaticide. Am J Psychiatry 1970; 126: 1414-20. 11. Bourget D, Grace J, Whitehurst L. A review of maternal and paternal filicide. J Am Acad Psychiatry Law 2007; 35: 74-82. 12. Friedman SH, Hrouda DR, Holden CE, Noffsinger SG, Resnick PJ. Child murder committed by severely mentally III mothers: an examination of mothers found not guilty by reason of insanity. J Forensic Sci 2005; 50: 1466-71. 13. Barone L, Bramante A, Lionetti F, Pastore M. Mothers who murdered their child: an attachment-based study on filicide. Child Abuse Negl 2014; 38: 1468-77. 14. Camperio Ciani AS, Fontanesi L. Mothers who kill their offspring: testing evolutionary hypothesis in a 110-case Italian sample. Child Abuse Negl 2012; 36: 519-27. 15. Grussu P. Neonaticide and infanticide: homicidal mothers, risk factors and preventive interventions. Psicologia Clinica dello Sviluppo 2012; 1: 37-64. 16. Hatters Friedman S, Resnick PJ. Child murder by mothers: patterns and prevention. World Psychiatry 2007; 6: 137-41. 17. Lewis CF, Bunce SC. Filicidal mothers and the impact of psychosis on maternal filicide. J Am Acad Psychiatry Law 2003; 31: 459-70. 18. McKee GR, Bramante A. Maternal filicide and mental illness in Italy: a comparative study. J Psychiatry Law 2010; 38: 271-82. 19. Resnick P. Child murder by parents: a psychiatric review of filicide. Am J Psychiatry 1969; 126: 325-34. 20. Aceti F, Carluccio GM, Meuti V, et al. Parental care and post partum depression: a case report. Riv Psichiatr 2012; 47: 221-5. 21. Aceti F, Baglioni V, Ciolli P, et al. Maternal attachment patterns and personality in post partum depression. Riv Psichiatr 2012; 47: 214-20. 22. Meuti V, Aceti F, Giacchetti N, et al. Perinatal depression and patterns of attachment: a critical risk factor? Depress Res Treat 2015; 2015: 105012. 23. Conde A, Figueiredo B, Bifulco A. Attachment style and psychological adjustment in couples. Attach Hum Dev 2011; 13: 271-91. 24. Feeney J, Alexander R, Noller P, Hohaus L. Attachment insecurity, depression, and the transition to parenthood. Pers Relatsh 2003; 10: 475-93. 25. Mazzeschi C, Pazzagli C, Radi G, Raspa V, Buratta L. Antecedents of maternal parenting stress: the role of attachment style, prenatal attachment, and dyadic adjustment in first-time mothers. Front Psychol 2015; 6: 1443. 26. Born L, Zinga D, Steiner M. Challenges in identifying and diagnosing postpartum disorders. Prim Psychiatry 2004; 11: 29-36. 27. Gale S, Harlow BL. Postpartum mood disorders: a review of clinical and epidemiological factors. J Psychosom Obstet Gynaecol 2003; 24: 257-66. 28. Riecher-Rössler A, Hofecker Fallahpour M. Postpartum depression: do we still need this diagnostic term? Acta Psychiatr Scand Suppl 2003; (418): 51-6. 29. Altshuler LL, Hendrick V, Cohen LS. Course of mood and anxiety disorders during pregnancy and the postpartum period. J Clin Psychiatry 1998; 59 (Suppl 2): 29-33. 30. Hatters Friedman S, Hrouda DR, Holden CE, Noffsinger SG, Resnick PJ. Filicide-suicide: common factors in parents who kill their children and themselves. J Am Acad Psychiatry Law 2005; 33: 496-504. 31. Aceti F, Aveni F, Baglioni V, et al. Perinatal and postpartum depression: from attachment to personality. A pilot study. Journal of Psychopathology 2012; 18: 328-34. 32. Meuti V, Marini I, Grillo A, et al. MMPI-2: cluster analysis of personality profiles in perinatal depression: preliminary evidence. ScientificWorldJournal 2014; 2014: 964210. 33. Kendler KS, Gatz M, Gardner CO, Pedersen NL. Personality and major depression: a Swedish longitudinal, population-based twin study. Arch Gen Psychiatry 2006; 63: 1113. 34. Podolska MZ, Bidzan M, Majkowicz M, Podolski J, Sipak-Szmigiel O, Ronin-Walknowska E. Personality traits assessed by the NEO Five-Factor Inventory (NEO-FFI) as part of the perinatal depression screening program. Med Sci Monit 2010; 16: PH77-81. 35. Kim THM, Connolly JA, Tamim H. The effect of social support around pregnancy on postpartum depression among Canadian teen mothers and adult mothers in the maternity experiences survey. BMC Pregnancy Childbirth 2014; 14: 162. 36. Podolska MZ, Majkowicz M, Sipak-Szmigiel O, Ronin-Walknowska E. Ways of coping in stressful situations and anxiety-state or anxiety-trait among women with symptoms of perinatal depression. Ginekol Pol 2009; 80: 201-6. 37. First M, Spitzer R, Gibbon M, Janet B. Structured Clinical Interview for DSM-IV-TR Axis I Disorders, Research Version, Patient Edition. (SCID-I/P). Biometrics. New York, NY: New York State Psychiatric Institute, 2002. 38. Fossati A, Borroni S, Marchione D, Maffei C. The Big Five Inventory (BFI). Eur J Psychol Assess 2011; 27: 50-8. 39. Goldberg L. The structure of Phenotypic Personality traits. Am Psychol 1993; 48: 26-34. 40. Srivastava S, John OP, Gosling SD, Potter J. Development of personality in early and middle adulthood: set like plaster or persistent change? J Pers Soc Psychol 2003; 84: 1041-53. 41. Martinotti G, Mandelli L, Di Nicola M, et al. 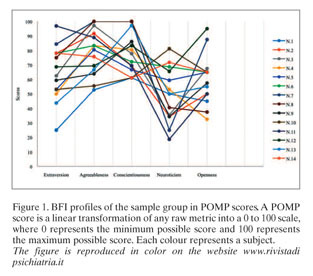 Psychometric characteristic of the Italian version of the Temperament and Character Inventory-Revised, personality, psychopathology, and attachment styles. Compr Psychiatry 2008; 49: 514-22. 42. Roberts BW, Jackson JJ, Fayard JV, Edmonds G. Conscientiousness. In: Jearly M, Hoyle R (eds). Handbook of individual differences in social behavior. New York, NY: Guilford Press, 2009. 43. Graziano WG, Eisenberg NH. Agreeableness as a dimension of personality. In: Handbook of personality. San Diego, CA: Academic, 1999. 44. Meier BP, Robinson MD, Wilkowski BM. Turning the other cheek: agreeableness and the regulation of aggression-related primes. Psychol Sci 2006; 17: 136-42. 45. Cloninger C, Przybeck T, Svrakic D, Wetzel R. The Temperament and Character Inventory (TCI): a guide to its development and use. St. Louis, MO: Center for Psychology of Personality, Washington University, 1994. 46. Poustka L, Parzer P, Brunner R, Resch F. Basic symptoms, temperament and character in adolescent psychiatric disorders. Psychopathology 2007; 40: 321-8. 47. Jylhä P, Isometsä E. Temperament, character and symptoms of anxiety and depression in the general population. Eur Psychiatry 2006; 21: 389-95. 48. Josefsson A, Larsson C, Sydsjö G, Nylander P-O. Temperament and character in women with postpartum depression. Arch Womens Ment Health 2007; 10: 3-7. 49. Jones L, Scott J, Cooper C, et al. Cognitive style, personality and vulnerability to postnatal depression. Br J Psychiatry 2010; 196: 200-5. 50. Tian T, Li Y, Xie D, et al. Clinical features and risk factors for post-partum depression in a large cohort of Chinese women with recurrent major depressive disorder. J Affect Disord 2012; 136: 983-7.